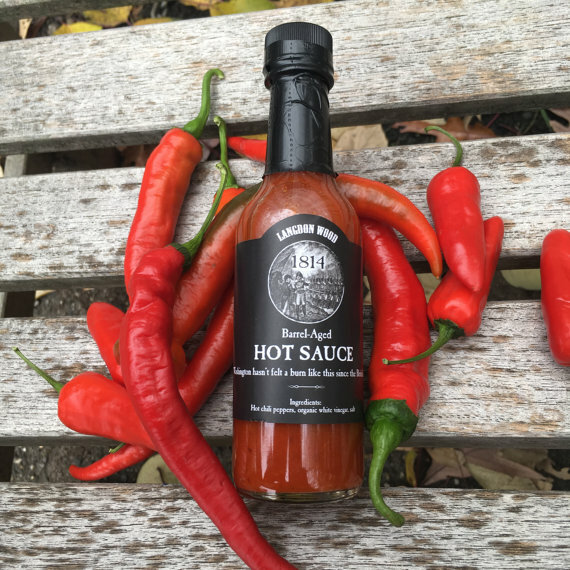 Barrel Aged Hot Sauce - 2018 Now Available! Ingredients: hot peppers (chili, peppers, hot peppers, white vinegar, salt, habanero, cayenne, jolokia, serrano, scotch bonnet, aji) organic distilled white vinegar, salt Heat rating: I have NO way of measuring the Scoville rating of this sauce, but by my personal taste it is on the medium to high side of “hot”. Only 256 bottles produced! Make haste and purchase yours now! PLEASE NOTE: If you had the first release, this is vastly different than last year’s. Version 2 is hotter, brighter, and thinner than the original. We released it on August 24, 2015; two hundred-and-one years to the day after the British Army marched on our city and burned it. The sauce was crafted using hot peppers from friends and farmers in DC, Maryland, and Virginia, including some from the very ground upon which the invaders launched their attack (Bladensburg). The chilies were mashed with salt and – at great personal risk to my skin, eyes, and respiratory tract – loaded into a ten-gallon oak barrel that once held wheat whiskey from a distiller in The Other Washington (Bainbridge Organic Distillers) and was subsequently used to age Langdon Wood Maple Syrup’s Bainbridge Edition. After a year the mash was blended with organic distilled white vinegar and readied for bottling. The variety of peppers used included Scotch Bonnet, Aji chilies, Jolokia (Ghost Pepper), cayenne, habanero, Hainan yellow lantern, Serrano, Fatalii, Jamaican Hot Chocolate, and others. 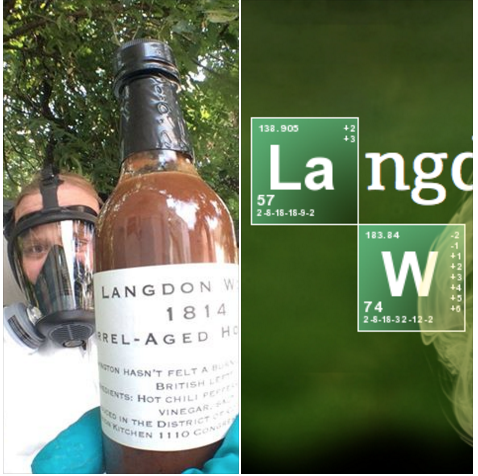 Langdon Wood’s 1814 Hotsauce is bottled every August, on the anniversary of the burning of Washington, DC during the War of 1812, and released to the public in early September. It’s a limited release of a couple of hundred bottles, so get on the list to be notified when it’s released each year so you don’t miss out!